Case price about 50% OFF! Because Larry’s understanding of the role of spiritual parents in the family of God is so profound, I enthusiastically recommend this book to you. Larry Kreider is a true servant to the Church . . . I trust this man because his heart is pure and his mind is clear. I have compiled all that I have learned about spiritual fathering, mothering and mentoring during the past 40 years in this newly released book. When many American movements have declined or disappeared, Larry shows the way to growth and stability through spiritual parenting. I devoured Larry’s book in one reading. Now I want to go back and digest it so I can pass on to others what I have learned. Larry Kreider has pioneered the way for others with this new book. He combines experience, knowledge and passion to guide us into Kingdom community. Larry has put cutting-edge concepts into laymen’s language. This is by far the best book on spiritual parenting that I have read on this subject. This book provides how-to blueprints and challenges all of us need to move beyond our dysfunctional and abusive relationships of the past to become models of relationship building for a new generation. Larry Kreider not only teaches on spiritual fathering, he is a spiritual father—and through his words, the Lord calls us to maturity. 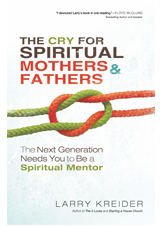 The Cry for Spiritual Mothers and Fathers is an awesome word for cutting-edge leadership in today’s Church. I, for one, want to be the kind of fatherly leader that Larry Kreider urges us to be. What a great book! It’s down to earth, practical, understandable and applicable to mentoring emerging leaders today—it’s authentic. This book is a must for those who are mentoring or discipling others.